Keith Turner was Meridian’s first chief executive. In his nine years with the business the company commissioned three major wind farms in New Zealand, developed and sold the Southern Hydro business in Australia and completed the second tail-race at Manapouri. 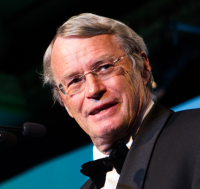 But Energy News editor Gavin Evans told the Deloitte Energy Excellence Awards audience the award particularly recognised Turner’s contribution to the creation of the competitive electricity market during the 1980s and 1990s. Turner was a member of one of the very first task forces that looked at the structural options for the industry in New Zealand. He served on the establishment boards for Transpower and Contact Energy, was a founder director of electricity market company M-Co and a founder member of the Market Surveillance Committee. He was also the first chair of Solarcity and the Electric Power Engineering Centre at the University of Canterbury. Evans said Turner probably made his biggest and longest lasting contributions during his roles in power planning and power development with NZED and then ECNZ. In those roles he championed the use of computer models like PRISM and SPECTRA which were the forerunners of the generation optimisation models the industry relies on today. They also underpinned much of the hydro development and operational performance improvements ECNZ achieved between its establishment in 1987 and its break-up in 1999. Critically, he also recognised the value of Maui gas and worked hard to secure its on-going availability for power generation during the 1990 contract renegotiations and again when Contact was split out of ECNZ in 1995. Turner said that throughout his 40-year career he had been fortunate to work with, and for, many talented people, most of whom had an understated passion for the whole energy industry and what it delivers for human life and human society. None of that would have been possible without the support of his wife Brenda, and his family, he said. Turner said he and his contemporaries had had great “fun” mucking around in Treasury with the industry’s institutional arrangements. But he said they were merely re-arranging the deck chairs compared with the changes now underway in the electricity sector. “We had no idea when we were doing that, what it might create,” he said.